I am so proud of my children because they all cook well. They try everything and it usually comes out delicious. I went to Trader Joe’s and found Sweet Sriracha Bacon Jerky. This is on my no buy list because it is so good. I could eat the entire bag. Andrew made an omelette with it. Add the scallions and just soften them. Beat the eggs and add to the scallions on a low flame. Add the cheeses and three slices of bacon. The bacon is already cooked so you don’t have to mess with another pan. 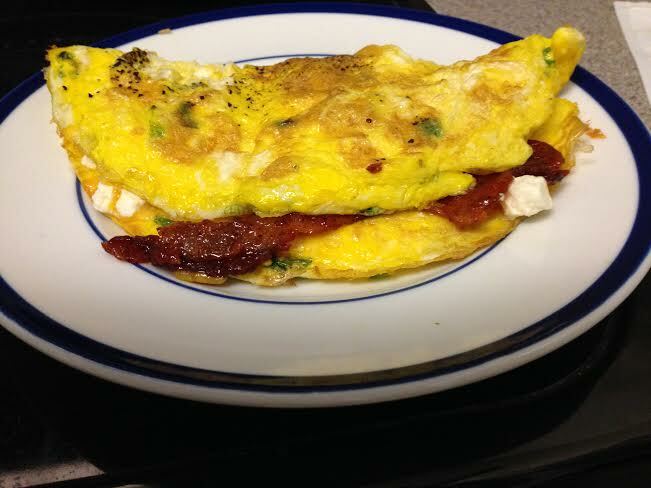 Flip the omelette in half and eat like you have never eaten an omelette before. So good, spicy and definitely antacid worthy.